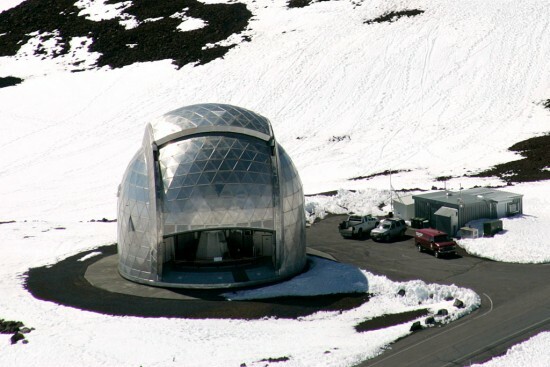 Caltech will begin decommissioning the Caltech Submillimeter Observatory (CSO) in Hawaii. Plans call for the dismantling of the observatory to begin in 2016, with the return of the site to its natural state by 2018. The decommissioning of the CSO is due to the construction of the next generation of radio telescope, the Cornell Caltech Atacama Telescope (CCAT), to be located in Chile. CCAT’s scheduled opening will occur prior to CSO’s dismantling. The Caltech Submillimeter Observatory is a cutting-edge facility for astronomical research and instrumentation development. Located near the summit of Mauna Kea, the CSO began operation in 1986. By 2016, the observatory will have given science 30 years of groundbreaking achievements. Caltech operates the CSO under a contract from the National Science Foundation (NSF). Its partners include the University of Texas and University of Hawaii. The observatory has been a host for many scientists worldwide. As part of its mission, observatory time is shared among University of Hawaii researchers, Caltech, the University of Texas, and international partners. “Our partnerships have made the observatory tremendously productive,” says Andrew Lange, chair of Caltech’s Division of Physics, Mathematics and Astronomy. “Without support from the state of Hawaii, its university, and the residents of the Big Island, we would not have been able to produce such valuable scientific achievements through the years.” -more- The CSO’s 10-meter radio telescope was designed and assembled by a team led by Caltech’s Robert Leighton and is considered one of the easiest telescopes to use for astronomical observations. Work at the CSO has led to the detection of heavy water on comets, which has helped determine the composition of comets. It has also led to the observation of “dusty” planets–which optical telescopes are often unable to see–allowing astronomers a better picture of a planet’s composition. Eleven staff members currently work at the Hilo, Hawaii offices of the observatory while about eight staff members work at Caltech’s Pasadena campus. When CCAT comes online in the next decade, it will be used to address some of the fundamental questions regarding the cosmos, including the origin of galaxies and early evolution of the universe; the formation of stars; and the history of planetary systems. CCAT is a joint project of Cornell University, Caltech and its Jet Propulsion Laboratory, the University of Colorado, a Canadian consortium including the University of British Columbia and Waterloo University, a German consortium including the University of Cologne and the University of Bonn, and the United Kingdom through its Astronomy Technology Centre at Edinburgh. More than twice the size of the CSO, the 25-meter CCAT telescope will be located in the high Andes region of northern Chile.